“I think,” Clyde said to his friends, “that bird is special. He has powers. Maybe…he’s psychic.” By the end of the day the word was all over school. It’s hard to realize that the same author who wrote Hatchet, a dramatic survival children’s book, could also write with such humor, and sometimes just silliness. Yet indeed, he manages to write an interesting story about a middle school boy and a bird. 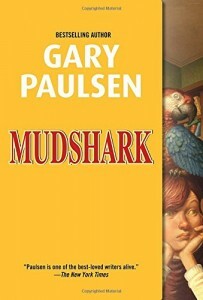 Given that it’s Gary Paulsen, the story also has heart and depth, but not in a mushy way that would turn off readers. I think the main audience for a children’s book by Paulsen continues to be boys, as Paulsen seems to depict their struggles very vividly. But this particular book is generic enough that any middle school reader would enjoy it. Mudshark is a short and quick read, with a simple mystery to be unravelled in its short pages. However, the mystery is not the point, as much as enjoying the way things fit together in an unexpected fashion in a school setting. It’s the kind of book that’s fun to have when you don’t want to dive into a huge, long, extended fantasy, and just want some well-written entertainment to spend time with. Lighthearted and playful, this one works for ages 8 to 10. After that age, I think the kids might find it too simple.